Hillary Clinton and Donald Trump both bought last-minute ads during Game 7 of the World Series. Surprise, surprise -- the ads were mostly negative. Some Cubs and Indians fans watching the game groaned when they saw the ads. Both campaigns recognized that Game 7 represented the greatest single collection of eyeballs in the week leading up to Election Day. Official television ratings will be available later on Thursday. Heading into Wednesday night, Fox expected Game 7 to be the network's most-watched MLB game in 15 years. Media observers predicted a ballpark audience of about 30 million viewers. So the Trump campaign booked three commercial spots on the nationwide broadcast. The Clinton campaign also booked three spots, and one of them was a 60-second ad. The 60-second spot, titled "What he believes," showed controversial Trump statements about women. Another negative Clinton ad, "Role models," showed children watching other controversial and offensive Trump remarks. "Role models" has been one of the Clinton campaign's best-reviewed ads of the general election. The third ad, "Just One," also showed clips of Trump and warned that he would be dangerous if elected president. The Trump campaign ran a mix of positive and negative spots. "Corruption" was a bleak ad accusing Clinton of "decades of lies and scandal." But "Choice" was a compare and contrast ad, saying "Clinton will keep us on the road to stagnation" while "Trump will bring the change we're waiting for." It ended: "A future brighter than our past. The choice is yours." Along with the campaigns, the NRA also had an ad on Wednesday night. The market price for an ad during Game 7 exceeded $500,000, but the campaigns were able to pay less. That is because broadcasters are legally required to give candidates the "lowest unit rate" for ad time in the weeks before an election. The World Series has been the most-watched series on TV for the past week, even when the prospect of a historic Game 7 looked out of reach. Fox Sports ad sales chief Neil Mulcahy's phone "has been ringing off the hook" ever since the Cubs advanced to the World Series, Advertising Age reported last week. During Game 6 on Tuesday night, the Clinton campaign had two national ads. Trump didn't have any, but the NRA had one. 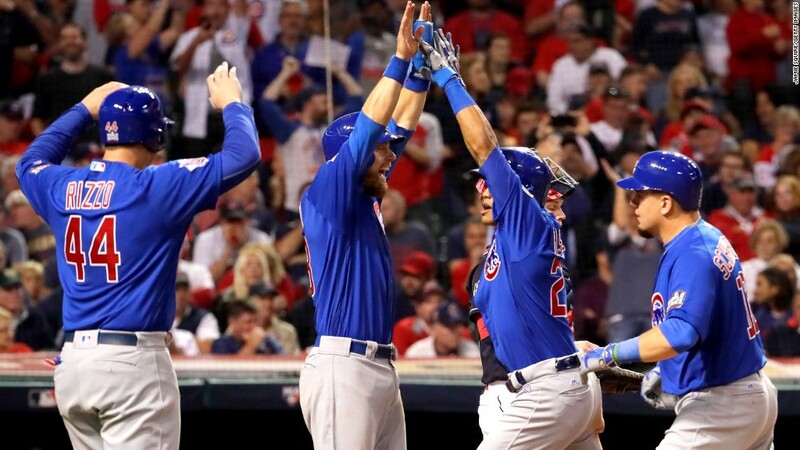 The Cubs' comeback against the Indians rewarded Fox with a seventh prime time broadcast. Advertisers started calling while Game 6 was still in progress.